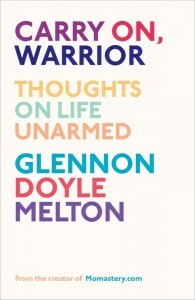 In Carry On, Warrior, Glennon Doyle Melton recounts the stories of her mistakes and triumphs with candor and humor, and gives language to our universal (yet often secret) experiences. She believes hat by shedding our weapons and armor, we can stop hiding, competing, and making motherhood, marriage, and friendship harder by pretending they're not hard. In this one woman trying to herself and others, readers find a wise and witty friend who will inspire them to commit to small acts of love that can change the world. I really feel that I need to review this is two parts to accurately convey my feelings about this book, so I'm going to start with the nitty gritty here--the writing. I find books written from blogs to be problematic. Writing a book and writing a blog are not the same thing and, taking pieces from a blog and putting them into a book tends to be unsatisfying for me. A blog post does not a chapter make. I'm sure there have been blogs to books that are able to avoid this misstep, but Carry On, Warrior is not one of them. Melton's writing is entertaining--in small doses. I suppose if I had had the luxury to read one chapter of this book every couple of days I might have found it more satisfying, but that was not the case. While there were passages, and sometimes entire chapters, that I found entertaining, the book as a whole was just too, well, bloggy. Carry On, Warrior also fell into the chronology trap. On a blog, you can follow whatever timeline your heart desires--it is one of the freedoms a blog allows. However, you cannot apply that same principle in a book. Melton seemed to be all over the place with her chronology. For example, she talked about wanting to adopt. Then she talked about not adopting, then she finished the book with the entire adoption drama. I really just couldn't keep things straight. I will admit that I'm not a regular reader of her blog, but I "like" her on Facebook and sometimes I pop in to see what she's writing about. However, beyond that, I am a pretty clean slate when it comes to Glennon Doyle Melton. Now that I've said that, you can consider yourselves all warned about what I'm about to write. The truth of it is that I just didn't like her. Glennon Doyle Melton. I'm sure she is a very nice person and, yes, she is an entertaining blogger. I know she raises money for needy causes and generally tries to do good. But, she just isn't my cup of tea. After reading her book, I think I'd go batty if I were in her company for more than half an hour. I tried to pin down what it was that really got under my skin--and that is why I had to divide this review up. Once I got past the blog-like nature of this book, I realized what it was--and I'm sure I'm going to offend more than a few "Monkees" over this. Melton presents herself as some sort of spiritual leader and, frankly, she is far from having the chops for it. Humor and spirituality can go hand in hand, but glibness and spirituality really don't and, unfortunately, I found her more glib than humorous. As the book went on, I just found her more and more annoying. To make matters worse, I read some of her recent posts on her site, which contradict (for lack of a better word) what she has written in her book about her family. After that, I just didn't believe her anymore and, sadly, that is the kiss of death for me with a book. I debated how many stars to give this book and I ended up with 3--while I do feel that my criticisms about the technicalities of the book are fair, I also recognize that my personal feelings about Melton are not shared by everyone. This review is part of a blog tour by TLC Book Tours. I received a copy of the book to read and review, but all opinions expressed in this review are mine, and mine alone. I received no further compensation for this review.